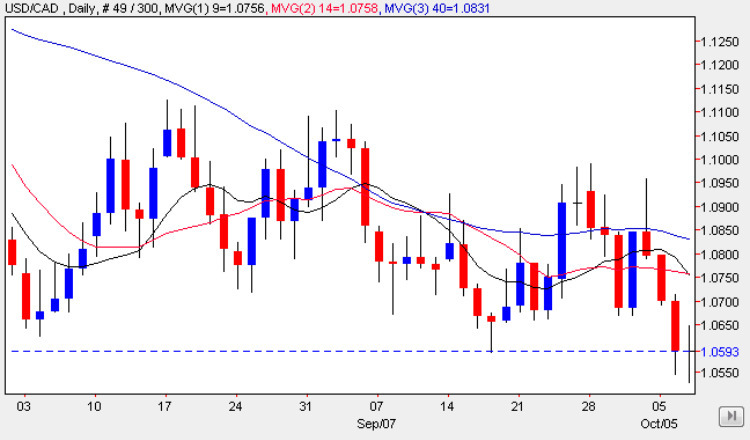 The poor old usd to cad continues to fall as the systemic US dollar weakness shows no sign of abating, and although yesterday’s trading session ended with a small doji cross, this seems unlikley to be the portent for any significant change in direction for the pair, as the technical picture is now very bearish, with prices having broken below the floor of the August to October consolidation band, which now presents a significant area of resistance to any reversal higher. This picture is confirmed by the 9 day moving average which has now crossed below the 14 day moving average once again, giving us a bear cross signal, and adding to the view that 1.02 remains the next likely target for the currency pair in the short to medium term. As I have said many times before only a dramatic change in the economic outlook for the US economy, and a subsequent shift in the FED’s view on raising interest rates, are likely to alter the markets view of the US dollar, and its current role as a low yielding currency in the carry trade, a position once held by the Japanese yen. Once the FED signal that interest rates may rise in the medium term, then at this point the US dollar may stage a recovery, but until this occurs then the trend will continue to be downwards, with the usd to cad pair following suit. Items of fundamental news on the economic calendar for Canada have included the Housing Starts data which came in better than expected at 150k against a forecast of 147k and later tonight there is a speech from BOC Senior Deputy Governor Paul Jenkins who is due to speak to the Board of Trade in Vancouver. As the text of his speech is released 15 mins earlier expect to see some reaction in the markets especially if there are any hints that Canada will follow Australia in raising interest rates. Details of the fundamental news for the US can be found on my eurodollar blog. The most important item for the US is the unemployment claims which have come in better than expected at 521k against a forecast of 543k. This should translate into stronger equities & further dollar weakness.